The LG Optimus G Pro brings several upgrades over the regular Optimus G, including a big 3,140mAh battery, but also a new screen and updated chipset. Let’s find out if the increase in battery capacity offsets the higher power demands of the screen, which is both bigger and higher res. Before we go on, we’d like to note that our Optimus G Pro review unit (which came from Korea) has a spare battery and a battery charger/phone stand in the box. The international version might not have these goodies. The call test is mostly a measure of the efficiency of the radio modem and the size of the battery (the screen is off and CPU doesn’t have much to do). The big battery certainly helped here – the LG Optimus G Pro came second only to the Motorola RAZR MAXX, with about half an hour of difference between the two. It should be noted that the RAZR MAXX has a bigger battery (3,300mAh) so the LG flagship did a great job here. With such a good start we were expecting to wait a long while before the web browser test completes but it was over pretty quickly – 6 hours and 40 minutes to be precise. That’s an hour and a half over what the regular Optimus G did, but over 2 hours less than the Samsung Galaxy Note II. The LG Optimus G and its 5.5” 1080p screen offer a great video-watching experience. And the good news is the phablet bounced back from the web test and went on for 8 hours and 40 minutes before its battery went from 100% to 10% (some video players refuse to play at under 10% battery charge, so this is our cut-off point). That’s, again, an hour and a half better than the non-Pro Optimus G but short of the Note II’s time. 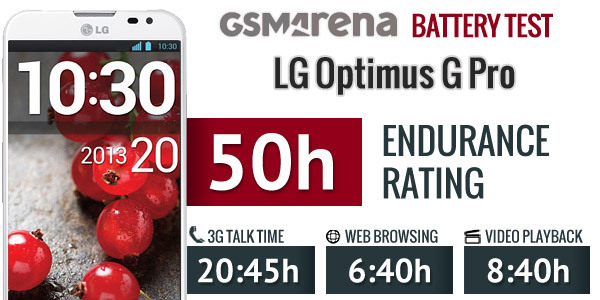 At the end, the LG Optimus G Pro earned an endurance rating of 50 hours. That’s how long it will last between charges if you do an hour of calling, hour of browsing the web and hour of watching a video each day. The stand-by power draw was a higher than expected, which affects the endurance time. 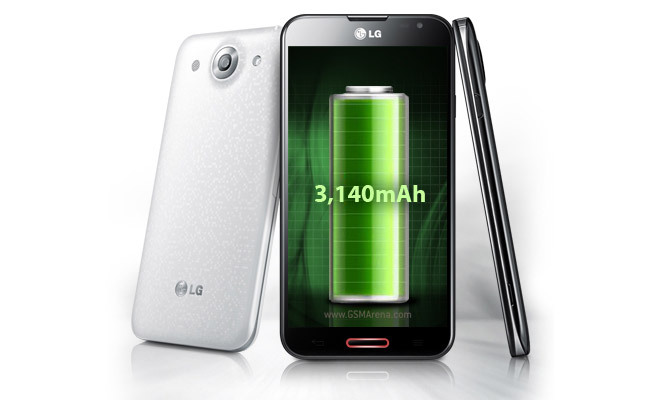 Still, the LG Optimus G Pro supports wireless charging so you can easily top it off. Also, remember that the charger that comes in the box is more powerful than most other chargers (and computer’s USB ports), so it will charge the phablet much faster. The G Pro will remind you if the charger is weak by displaying the “slow charging notification”. We were hoping for a bit more endurance out of the LG Optimus G Pro, but it will still get you through a busy day, even without topping it off. We do hope that LG leaves the spare battery and battery charger in the international retail box, which will instantly double the battery life numbers.